ATF is responsible for licensing persons engaged in manufacturing, importing, and dealing in firearms. Compliance inspections are conducted by ATF Industry Operation Investigators (IOIs). There are 626 field IOIs nationwide. Thre were 140,000+ Federal Firearm Licensees (FFLs) in 2014. 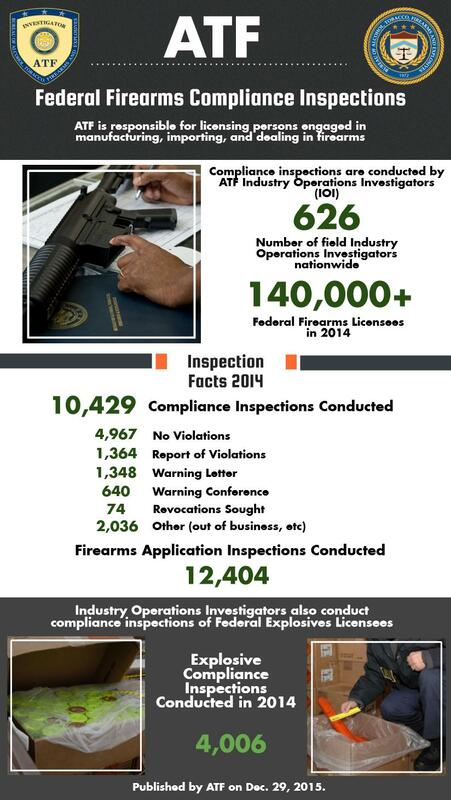 ATF conducted 10,429 Compliane Inspection ins Fiscal Year 2014. 4,967 inspections had no violations. 1,364 inspections had a report of violations. 1,348 inspections received a warning letter. 640 inspectins receied a warning conference. 74 inspections resulted in license revocations being sought. 2,036 inspections resulted in other results, such as out of business. ATF conducted 12,404 firearms application inspections. In fiscal year 2014, ATF conducted 4,006 explosive compliance inspections. Published by ATF on December 29, 2015.